Local engagement is important because no one understands a neighborhood better than the people who live, work and play there. Neighborhood Councils are answering that need and strengthening democracy in Los Angeles by embracing and supporting the diversity of neighborhoods that comprise the City of Los Angeles. Working together, Neighborhood Councils have generated success stories across the City – from community health clinics in Pico Union, to a greening strategy for Downtown, to addressing traffic and transportation issues in West LA. Los Angelenos can get involved in EmpowerLA as much or as little as they like. From staying informed through our website, to attending local Neighborhood Council meetings, volunteering on Committees and/or running for a Board Member position, there’s an engagement opportunity that meets everyone’s needs and schedules. 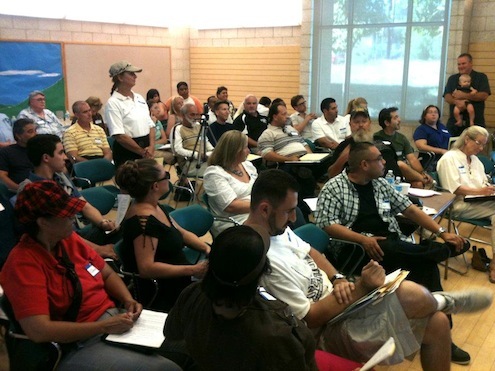 As part of the Plan for a Citywide System of Neighborhood Councils, the Department of Neighborhood Empowerment’s responsibility is to provide operational support to and facilitate the sharing of resources among Certified Neighborhood Councils, including but not limited to, meeting and office space, office equipment and mail and communications in order to communicate among constituents, Certified Neighborhood Councils, City Departments and governing officials. Since the inception of the Plan for a Citywide System of Neighborhood Councils, the operational needs of Neighborhood Council’s continues to evolve and thus the Department has provided a list of additional resources which include acquiring translation, hiring temporary help, funding guidelines and conducting outreach. Below we are providing Neighborhood Councils with valuable tools in their daily operations. Neighborhood Council Board size various across the City from 7 to over 30 individuals depending on what the neighborhood believes will meet its needs. They hold regular meetings – at least one every three months. Many Councils hold meetings more often and have working committees as well. Neighborhood Councils receive public funds of $37,000 each year to support their activities. This may include creating events and programs that respond to the unique needs of their community or advocating on behalf of the issues they care about such as crime, roads and streets, the creation of safe spaces for children, gangs, and economic development. To learn more about Neighborhood Council success stories, click here. Meet with the Mayor to discuss priorities in the annual development of the City budget, prior to its submittal and approval by City Council. Receive advance notice of issues and projects that are important to them and their neighborhoods so they can understand, discuss them, and voice the opinions of the neighborhood to the City before final decisions are made. Neighborhood Councils represent neighborhoods with a minimum population of 20,000 people. The average population represented by a Neighborhood Council is 38,000 people. There are currently 96 Neighborhood Councils across Los Angeles with more in development. Councils must establish bylaws and go through the certification process with the Board of Neighborhood Commissioners and the Department of Neighborhood Empowerment before they can operate. How to Form a Neighborhood Council? The Neighborhood Council certification process takes between 6 months and a year depending on how much time you and other community stakeholders can dedicate. Having no less than 20,000 residents within the desired Neighborhood Council boundary though exceptions do apply. Outreaching to the community to collect between 200 to 500 signatures from community stakeholders within the proposed Neighborhood Council boundaries. Preparing the proposed Neighborhood Council bylaws. Submitting the proposed Neighborhood Council financial accounting system. Our staff will be happy to assist in the formation of your Neighborhood Council so please don’t hesitate to contact us at (213) 978-1551 or email us at NCSupport@lacity.org. Because Neighborhood Councils are created by the Los Angeles City Charter, they are subject to many of the federal, state and local laws that govern other City departments. Every Neighborhood Council also has bylaws and other standing or procedural rules they follow, too. In addition, Neighborhood Councils must abide by laws preventing workplace violence, sexual harassment and discrimination. Americans with Disabilities Act – A federal law designed to protect the rights of individuals with disabilities. Title II of the Americans with Disabilities Act (ADA) applies to the operations of state and local governments. Brown Act – The Ralph M. Brown Act is a state law requiring open meetings from government agencies and applies to Neighborhood Council meetings. Conflict of Interest Laws – Various state and city laws to ensure that government officials are free from bias caused by their own financial interest so they may act in an impartial manner. Los Angeles City Charter – In 1999, the City Charter established the Neighborhood Council System and the Department of Neighborhood Empowerment which supports the Neighborhood Councils “to promote more citizen participation in government and make government more responsive to local needs…” Charter Section 900. Public Records Act – A state law providing the public access to government records. Neighborhood Councils must abide by a strict time line to respond to Public Records Act (PRA) requests. Various local ordinances have also been enacted to establish the Neighborhood Council system. Ordinance 172728 – Created the Department of Neighborhood Empowerment following the passage of the City Charter. Ordinance 176704 – Established regulations to implement the Plan for a Citywide System of Neighborhood Councils. Ordinance 173184 – Created the Department of Neighborhood Empowerment Fund. Ordinance 175937 – Transferred the responsibility for leasing and renting office and meeting space for Neighborhood Councils from the Department of General Services to the Department of Neighborhood Empowerment, thereby streamlining the acquisition of space for Neighborhood Councils. Ordinance 176477 – Exempts Neighborhood Councils from adopting a conflict of interest code and filing the Form 700 financial disclosure statements. These Best Practices highlight the great work Neighborhood Councils do around the City and provide tips on how to replicate them in your neighborhood. Share your successful events with the rest of the Neighborhood Councils by contacting us at (213) 978-1551 or emailing NCSupport@lacity.org. EmpowerLA Leadership Academy: The EmpowerLA Leadership Institute is designed to help Neighborhood Council Board members and stakeholders within the community be more effective in making their voices heard and making a difference in their neighborhoods. Inspired by Carol Baker Tharp, past General Manager of the Department of Neighborhood Empowerment, the Institute provides opportunities to learn the information, hone the skills, and nurture the relationships that lead to success for Neighborhood Councils. Ms. Tharp maintained the belief that civic engagement is the cornerstone of democracy and that empowering individuals can empower neighborhoods and improve quality of life for all residents of the City of Los Angeles. Click here for more details. Filing a Community Impact Statement – In mid-2003, the City began a new system through which Neighborhood Councils can adopt Community Impact Statements that summarize its official position on City issues and have them printed directly on the meeting agendas. It’s a unique and unprecedented way for each Neighborhood Council’s voice to be known to the City Hall decision-makers and the world before a vote is taken. There are several ways to send Community Impact Statements to the City Clerk for inclusion on the agendas of the City Council, its committees, and City commissions. A paper version may be sent via postal mail, hand-delivery, fax or online at cityclerk.lacity.org/cis. Early Notification System (ENS) is an on-line system where stakeholders can subscribe and receive meeting agendas and special events announcement sent to their e-mailbox. To start your subscription, click here. EmpowerLA posts Neighborhood Council meeting agendas or a Neighborhood Council sponsored special event announcement on the City’s website, please e-mail a copy of the document in Adobe Acrobat PDF format to: done.ncagendas@lacity.org. Please allow 7 business days to be posted. The Neighborhood Council is responsible for the document’s content and accuracy. The NC agendas and NC sponsored special event announcements are available at https://lacity.org/ under “City Meetings & Agendas” and “City Events Calendar”. LA City Clerk Connect – LACityClerk Connect is a web service offered by the Office of the City Clerk where the Council File Management System (CFMS) is readily accessible. CFMS (formerly known as Council File Index) is a your online access to a comprehensive file index and management system with a summary and details of all legislation considered and/or acted upon by the Los Angeles City Council. It is also a subscription service where you can receive automatic e-mail notifications and RSS feeds when a Council File is updated. To start searching and viewing City Council legislative records, click here.